The Toyota Tundra is a beast of a pickup, yet it really is a blank palate waiting for your customization. What are the top aftermarket products you should look at? Here they are in no particular order. Have a new truck? Wondering what to do modify on it? Here is a list. If you bought your truck with one already, you know the benefits of having a spray-in bed liner. This extremely durable rubber product not only protects the factory finish, it is often resistant to just about anything. There are several products out there and the top popular brands are Line-X and Rhino. Click here for a debate on which one to use. Whatever your plan for using your truck, there will be times when you need to cover up what you are towing. This means either using tarps or investing in a tonneau cover and/or truck cap. These days tonneau covers have evolved and you don’t have to be stuck with snaps. There are tri-fold covers, retractable covers and hard plastic covers that raise. Truck caps also have a lot of new features like side windows that vent and open. Another benefit is that they lock as well. One of the common theft items in regards to trucks is the gear in the bed and the tailgate itself. Having a locking truck cap will really help deter theft. This is a personal preference item, but if you really want to hear the roar of the V-8, you need a new exhaust. The current exhaust setup is really pretty quiet. There are many different options out there including BA Mufflers. They are a small shop that has a high reputation. 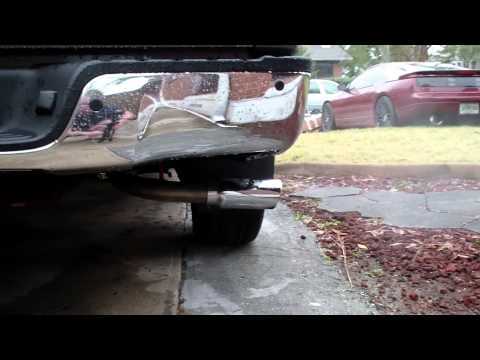 Check out this video on how the exhaust improves the sound. One of the common things you are going to read about your new truck is about cold air intakes. These intakes work on the simple principle of adding increased air flow into your engine. More air=more performance. Now with that there are many claims of incredible MPG increase or HP. Yes, it will help. No, it won’t turn your truck into a Prius. Most truck guys seem to fall into two categories. Those that LOVE to modify their trucks and those that like it stock. Lift and leveling kits are really for those that want to tinker. A lot of new Tundra owners will level the front end to remove the “rake” the truck has from the factory. Also, lift kits are extremely popular. While a lift kit is cool, it is actually a piece of the lifting process with money being spent on larger tires, alignments, re-calibration of ECU. Have a need for speed? Want a pickup that can go drag racing? Yes, it is possible with a TRD supercharger and tuning kits. Believe it or not, there are 11 second Tundra pickups. Don’t take our word, check out this video. What have you done to your truck? What item do you most want? Let us know!